What's the smallest thing that can mimic proteins? But we have made some rigid multi-cyclic peptides with real 3-D diversifiable arrangements of functional groups. 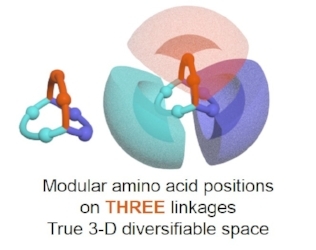 Nanoteins are multicyclic peptides that have modular amino acid residues arranged in a special manner, so that they can access the real 3-D diversifiable chemical space. To the right is the structure of the first-generation Nanotein. It is a bicyclic peptide bearing modular amino acids on all three linkages. The domes illustrate the accessible 3-D space by the side chain groups. Just like a protein, we fold linear peptide chains into intricate shapes and fix them using chemical linkages. AND, if we want, we can unfold the Nanoteins, and retrieve the linear sequence again! Proteins can specifically recognize things and catalyze reactions. We think Nanoteins can do the same thing. We will show you examples once we finish cooking.